Lenovo ThinkPad Edge 68852BU is the new 15.6 inch Windows 7 computer of innovative Lenovo with Intel Core i5 processor at 2.6GHz speed. It is designed for everyday computing needs of students, casual users and home office workers- pretty much everyone other than 3D gamers and multimedia editors. Powerful performer, nice keyboard design, impressive picture quality.. 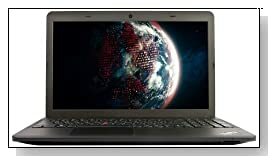 Processor is the Intel Core i5-3230M (3MB Smart Cache) at 2.60GHz speed- up to 3.2GHz with Turbo Boost function. Memory is a 4GB PC3-12800 at 1600MHz DDR3 SDRAM for sufficient multitasking and the hard drive is a 500GB Serial ATA at 7200RPM rotating speed- enough space for most laptop users to save their files. 15.6 inches at 1366 x 768 pixel resolution with Intel HD 4000 Graphics offers good quality clear display for most but not for visual artists. Accurate and smooth trackpad underneath the keyboard is quite user friendly. Keyboard is good too with its 10 key numeric keypad to make things easier for data entry. Operating system is the 64 bit version of the Windows 7 Professional- good news for those that dislike the newer Windows 8. We also think this is an advantage of the new Lenovo Thinkpad as there aren't many laptops that come with the Windows 7 installed. Battery life is between 4 to 5 hours depending on what you do on the system. Professional and slim matte black Lenovo ThinkPad Edge weighs only 5.4lbs and its thickness is just under 1 inch. It runs quietly with no noise from the cooling fan. It comes with a DVD drive, Bluetooth 4.0, standard Wifi 802.11b/g/n connectivity, Network Card IEEE, Gigabit Ethernet, 1 x USB 2 port, 2 x USB 3.0 ports, an HDMI port, VGA port, RJ-45 and Audio Line Out. Conclusion: Lenovo ThinkPad Edge 68852BU is a good solid machine with a fast and powerful processor that is good for everything other than memory intensive graphics editing and latest 3D games- casual gaming is just fine though. It is offered at a budget price(after the big Amazon discount) so what you get in terms of technical specs and features should be more than what you would expect. Highly recommended!